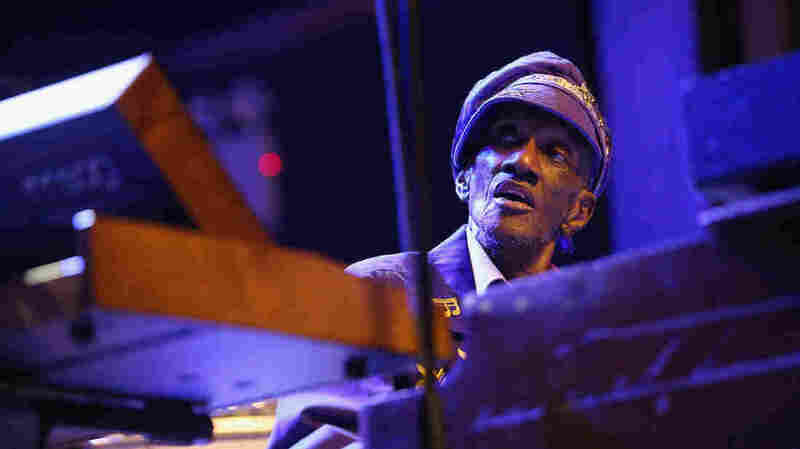 Bernie Worrell Of Parliament-Funkadelic Dies At 72 : The Two-Way The influential keyboardist and composer had been diagnosed with late-stage lung cancer. Worrell was a key member of Parliament-Funkadelic and played with the Talking Heads. Bernie Worrell performs at the Black Rock Coalition Presents: All The Woo In The World â An All-Star Celebration benefit concert on April 4 in New York City. The concert was raising money for Worrell's medical costs. Keyboardist and composer Bernie Worrell, who helped shape the sound of the band Parliament-Funkadelic and influenced countless artists across a wide range of genres, died Friday at 72. Worrell announced earlier this year that he had been diagnosed with late-stage lung cancer. His musical life began early — according to his official biography, he started studying piano at age 3, wrote his first concerto at age 8 and performed with the National Symphony Orchestra in Washington, D.C., at 10. The classically trained keyboardist (he studied at Juilliard and the New England Conservatory of Music) made his name — and an indelible mark on music — in the world of P-Funk. Worrell, aka "The Wizard of Woo," was an early member of Parliament-Funkadelic, George Clinton's sprawling, theatrical and wildly influential funk collective. The Rock and Roll Hall of Fame notes that Parliament and Funkadelic "prefigured everything from rap and hip-hop to techno and alternative," with latter-day disciples including Prince and the Red Hot Chili Peppers. Worrell was one of the key collaborators shaping the sounds of the collective. He was particularly famous for his innovative embrace of the sounds of synthesizers. In the 1980s, Worrell helped reshape the sound of the Talking Heads and became a regular member of their expanded lineup. Even if you don't know Worrell, you've probably heard his work. As a studio musician he contributed to scores of albums, and P-Funk songs are frequently sampled on hip-hop tracks. In 1991, when his second solo album came out, Worrell spoke to reporter Andy Lyman for Morning Edition. Worrell said his mastery of musical fundamentals was central to his genre-mashing work. the art of creating — composing — because they won't even know how to make a chord. The chords are already just on a button. What is the root? What's the third? What's the fifth of the chord? "I feel that a lot of artists and parents who are interested in music should get music back into the mainstream in school systems," he said. "That's being lost also." In January, Worrell announced that he had been diagnosed with late-stage lung cancer. An online fundraiser and star-studded benefit concert helped cover his medical expenses — and gave many in the music community a chance to honor his life while he was still there to hear it. George Clinton and Bootsy Collins of P-Funk, David Byrne and Jerry Harrison of the Talking Heads, Fred Schneider of the B-52s, Buckethead, Living Colour and Questlove, among others, performed at the "All The WOO In The World" benefit concert in April. And Worrell played too, of course. The crowd shouted "We love you, Bernie!" as he struggled for words, holding a proclamation from the mayor of Newark, N.J., in his honor. "I don't know what to --" Worrell said. "Thank you," he finally said. "I love you, too."